One of the first things you need to know before going out on the course is the basic golf etiquette that is practiced by all golfers. You won't be penalized for not knowing certain golf etiquette, but you can really bother the other golfers around you. A big part of golf etiquette is sticking to the rules, even when you are the only person aware of an infraction. There isn't a referee on the course to govern play, therefore, the individual is responsible for applying the rules to their game. In fact, many professional golfers have called themselves on rules that costs them thousands of dollars and even championship titles. So, if you are considering whether you should tell your playing partners whether you grounded your club in the bunker, its completely up to you, but you're only hurting yourself when you don’t apply the rules to your game. When on the golf course, you can generally use common sense to apply to your golf course etiquette. Try to be as quiet and still as possible when other golfers are hitting a golf shot. As you know by now, there is a lot to think about when you are taking your golf swing. The more you are able to concetrate on the golf shot, the better you chances are for hitting the ball the way you want to. Another piece of golf etiquette that you'll need to know is to never walk on the line between someone's golf ball and the cup. 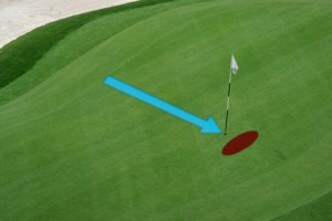 This can cause spike marks to rough up the line a golfer is getting ready to putt on. When it comes to golf etiquette, do unto others as you would have them do unto you. For a great comprehensive guide to the etiquette of golf, you can go to the United States Golf Association's (USGA) etiquette page.